This is the solar charger that proved you could go green in style. At the airport, on vacation, in remote locations, in an emergency situation- Dependable and durable. 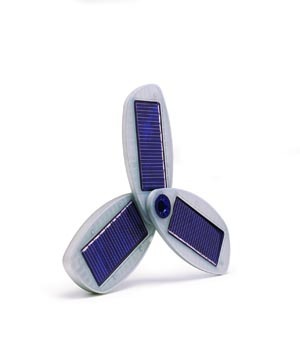 Just unfold the blades and blaze, with the sun soaking, eco-friendly Classic Hybrid Solar Battery Charger. Long life internal 1650Amh Lithium-Ion Battery. 3 High efficiency solar cells. Charging cable input (USB / AC). In the field. I think this is a valuable device to have on touring trips for those techies that always have a cell phone or MP3 player. It does require direct sunlight and as clear a day as possible or it will take a very long time to charge. Chargers with an enclosed battery are the only way to go when space is limited. While on the road If you do happen to get access to an AC outlett you can charge up the battery for tthe time when the sun does not provide enough power.